My Parenting Victory (and a HUGE giveaway)! Welcome to April’s Finding the Funny! Before we start sharing our funny posts, we have a (huge) giveaway! I’m not sure at exactly at what point I officially lost my crap, but I did. It was Saturday afternoon at 2pm and I could honestly say that I hadn’t showered since Wednesday, brushed my teeth since Thursday and had just used my cami shirt to blow my nose since I didn’t have time to find a kleenex. Yes, I really am that awesome. Also, I made sure to do this while my husband was watching in an attempt to impress the desperation of my situation upon him. It would be so easy to beat myself into the ground for this. Have I really let myself go this badly?! But you know what? Through all of this hyped-up egg-themed drama, MY KIDS WERE CARED FOR. They were fed, they were clean (if you ignore the chocolate bunny remains smeared all over their faces), and they were happy (let’s just pretend that meltdown when Mommy refused to replay Mickey’s Great Easter Clubhouse Hunt for the 16th time didn’t happen). So while it would seemingly be a final count of Easter weekend: 1, Mom of the Year: 0, I am declaring victory. We survived. We had fun. And we still have a boatload of pastel plastic grass spread all over the carpet to prove it. 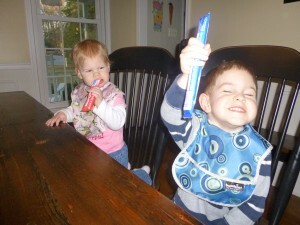 And the moment in the midst of the craziness when I got my kids to down some healthy protein-filled Chobani yogurt? Someone is seriously going to have to give me a parenting award ASAP. Okay, not a great picture, but give me props because I got a 1 yr. old and a 3 yr. old to look in the vicinity of the camera at the same time? Raising kids isn’t easy, but Chobani Champions is all about celebrating the little victories in parenting. Together with Chobani, we wanna make YOU a winner. 10 Runners-up will receive one case of Champions Tubes delivered to their doors! Giveaway begins April 2 and ends at midnight April 8. Chobani is gettin’ social to find the good, the bad, the ugly… and a REAL taste of life with kids. Join in on the convo! Join all of us on twitter for #spikedpunch Sunday night, April 7 from 9-10pm EST. 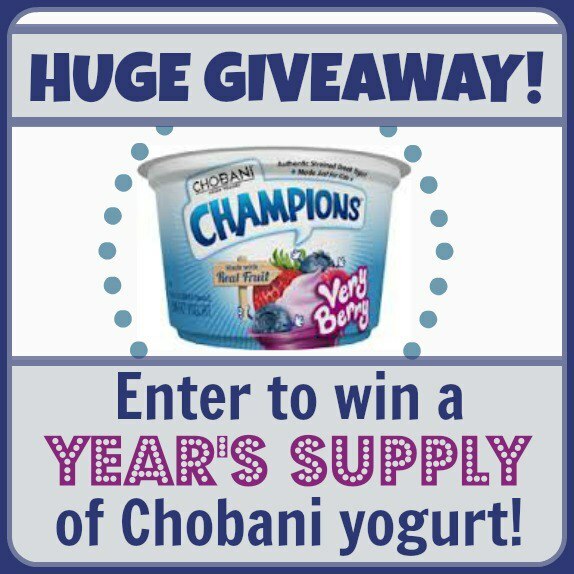 Enjoy the party and a chance to win 1 of 2 cases of Chobani tubes! It’s Finding the Funny Time! Link up an old or new funny post. Link up as many times as you want (we’re serious.) The party is open until Friday at midnight. The earlier you link up, the more clicks you’ll get. Click around and meet the other funny bloggers that are linking up. Follow the Finding the Funny Pinterest board. We’ll all be pinning our favorites throughout the month. We don’t ask you to link back to us or include a button on your blog, but we do ask you to send out a tweet or post about the party on your Facebook page. Be sure to use #findingthefunny.